Sunday 10th June was a beautiful day in the hills and a very busy day for the Wicklow Mountain Rescue Teams. 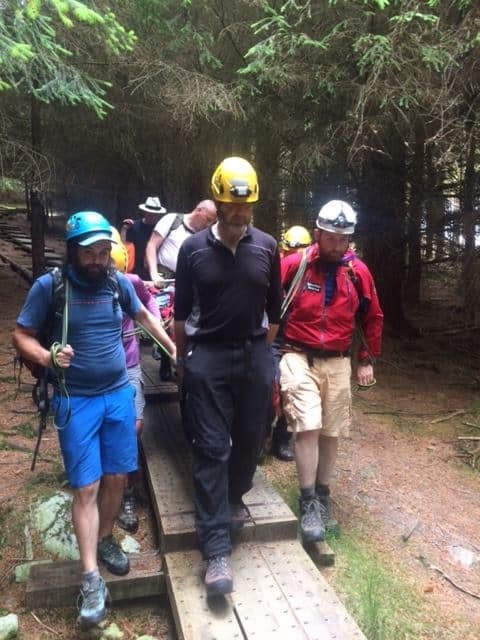 At 12:30hrs the Glen of Imaal Mountain Rescue Team and Dublin Wicklow Mountain Rescue Team were tasked by An Garda Síochána (AGS) to assist a teenager stuck on the cliffs at the side of Powerscourt Waterfall. While out exploring the boy had become crag-fast and was unable to move up or down. Mountain Rescue (MR) Personnel located the boy using SARLOC technology and accessed his location from the top of the cliffs. Using a rope system to secure his safety they assisted the boy to the top of the steep ground from where he was walked returned to his parents waiting at the bottom. The incident was stood down at 15:30hrs. We would like to thank The Coast Guard crew of R116 and R117 who were on standby to assist if necessary. An MR team member on her way to the Powerscourt callout came across a motorcyclist who had come off his bike after hitting a deer. The motorcyclist was assessed by the MR medic, treated for a suspected spinal, wrist and shoulder injury. He was packaged and transferred to HSE ambulance when it arrived. After assisting with the casualty and managing traffic hazards on the small and busy road MR team members headed on to the Callout in Powerscourt. At 15:08 while this callout was ongoing a call came in from AGS for MR teams to standby to assist an ambulance crew to evacuate a casualty from Bray Head. MR personnel responded, but the casualty was successfully walked out and MR was not required. At 17:10 AGS tasked the MR teams to assist a woman who had fallen and hurt her knee on the Spink in Glendalough. The exact location of the woman was determined using Sarloc Rescue technology. The woman’s injury was treated by a HSE advanced paramedic. She was stretchered from the mountain via the blue route to a waiting ambulance and transported to hospital for further care. The incident was stood down at 20:23. At 18:25, while responding to the callout on the Spink, MR was tasked to another incident by AGS. Three people became crag-fast while traversing the boulder-field near the Miners’ Village. When the MR party arrived at the Miners’ Village they found that one of the party had descended safely, but the other two were still stuck. The MR party walked in and, using a rope system to secure the subjects, assisted them to the top of the boulder field. From there they were able to safely walk out and back to the car park. The incident was stood down at 20:23. At 19:30 while en-route to the boulder-field callout MR team members came across a man seeking assistance to locate the rest of his party. They had become separated and he was concerned for their safety. MR personnel drove the forest tracks and located the missing party. They were escorted back to the upper lake car park, where the group was reunited. The incident was stood down at 20:23. Mountain rescue would like to thank the Irish Coast Guard helicopter crews of Rescue 116 and Rescue 117 who were on standby, and the HSE National Ambulance Service (NAS) for their assistance today.